Still using D&D Next examples at this stage of conversion as you can tell by the format. I took a lot of inspiration from D&D Gamma World 7th Edition for these guys. Art courtesy Paizo though for the pygmies. I added the thornie to beef up the vegepygmies as I run a larger party in my games. Its also thematic. Drub was a trophy collector and often put interesting specimens of various xenos races and Halo Artifacts into stasis for personal viewing or for selling later. Some of these creatures have escaped their stasis fields due to medaling by the Flayer or the crash. Vegepygmys are created by a dangerous fungus known as russet mold—creatures slain by russet mold serve as incubators for the mold’s spores, and a day later, the dead body bursts to release 1d6 fully grown Vegepygmy s. A vegepygmy has no real relation to the body from which it emerges, but the creature may yet retain a strange sort of reverence for its “birth corpse” and carry with it a grisly memento from the body, typically a few bones or teeth. Often, a vegepygmy uses such bones to craft a crude spear or some other weapon. Vegepygmy tribes live in tightly knit communities and fiercely guard their patches of russet mold. Vegepygmies cannot speak—they communicate via a crude language of rhythmic taps, beats, and clicks. Hunting parties echo these exchanges through the caves they travel. Vegepygmies stand 2 to 4 feet tall and weigh between 15 to 45 pounds. Approximately 1 in 20 vegepymies are chieftains. A vegepygmy chieftain is an advanced vegepygmy (often one with class levels) that carries an infestation of russet mold spores in its flesh. A vegepygmy chieftain infects any creature it hits with its natural weapons with russet mold spores (see below). Russet mould is found in dark, wet areas. At a distance of 30 feet or more, it is likely to be mistaken for ordinary rust (DC 25 Wisdom check required to see it for what it truly is). A patch of russet mould is about 5 to 7 feet in diameter. When a living creature comes within 5 feet of a patch of russet mould, it releases a cloud of spores in a 5-foot radius. All in the area must succeed at a DC 15 Constitution save or take 2 points of Constitution damage. Another DC 15 Constitution save is required each day to avoid taking another 2 points of temporary Constitution damage. A creature killed by russet mould rises as a vegepygmy in 24 hours, unless antiplant shell is cast within one hour. Antiplant shell does not actually prevent the creature from becoming a vegepygmy, but it does delay the process for the spell’s duration. After that, only a wish or miracle can prevent the creature from rising as a vegepygmy. Russet mould is immune to fire and cold. Acid-based effects, alcohol (at least 1 gallon per foot diameter of mould), continual flame, or remove disease instantly destroy russet mould. Short, thin, and green, this small humanoid wields a spear. Tendrils of fungus dangle from its arms, midsection, and legs. Immunity: Electrical damage has no affect on the vegepygmy. Vulnerability: Vegepygmy are vulnerable to acid and alcohol. Bushwhacker: During the first round of combat, the vegepygmy has advantage on attack rolls against any target that has a lower initiative. Sneaky: The Vegepygmy can attempt to hide at the end of a move without using an action in natural terrain. Stealthy +5: The Vegepygmy gains a +5 bonus to Dexterity (Stealth) checks in natural terrain. Melee Attack—Claw: +1 to hit (reach 5 ft.; one creature). 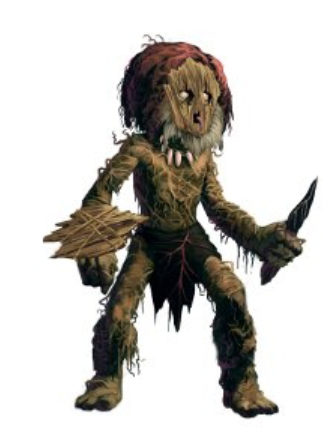 Hit: 2 (1d6 – 1) slashing damage (minimum 1 damage), or 5 against creatures the vegepygmy has advantage against. Melee Attack—Longspear: +1 to hit (reach 5 ft.; one creature). 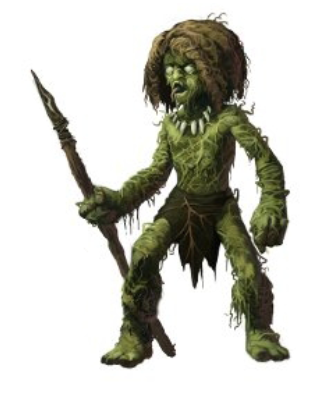 Hit: 2 (1d6 – 1) piercing damage (minimum 1 damage), or 5 against creatures the vegepygmy has advantage against. Ranged Attack—Longspear: +2 to hit (range 20 ft./60 ft.; one creature). Hit: 4 (1d8) piercing damage. Looking like a larger version of the normal vegepygmy this particular specimen is covered in rust coloured powder like substance. Melee Attack—Claws: +3 to hit (reach 5 ft.; one creature). Hit: 4 (1d6 + 1) piercing damage), or 7 against creatures the vegepygmy has advantage against. Ranged Attack—Javelin: +3 to hit (range 30 ft./120 ft.; one creature). Spore Cloud (Recharge 6): The chieftain may release spores as an attack action. The spore cloud has a 20 ft. radius and is treated as a normal russet mould attack. This four legged creature looks and acts like a dog, but its made from plant matter. Immunity: Electrical damage has no affect on the thornie. Vulnerability: Thornie are vulnerable to acid and alcohol. Keen Senses: The thornie gains a +5 bonus to Wisdom (Perception) checks to detect hidden creatures. Pack Tactics: The thornie gains a cumulative +1 bonus to attack rolls, to a maximum of +5, for each friendly creature that is within 5 feet of its target. 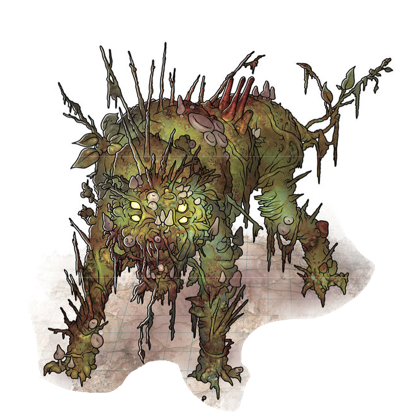 Thorns: Any creature using natural attacks suffers 2 (1d4 + 1) piercing damage from the thorns covering the creature’s body. Melee Attack—Bite: +5 to hit (reach 5 ft.; one creature). Hit: 1d10 + 2 piercing damage, or 13 (2d10 + 2) piercing damage against a prone creature. If the attack deals maximum damage, the thornie also knocks the target prone. Russet Bomb: When the thornie is reduced to 0 hit points it explodes in a 5 ft. radius burst of russet mould cloud. The triggering enemy takes 1d6 extra physical damage as he is pierced by thorns and must endure a russet mould spore attack as well.